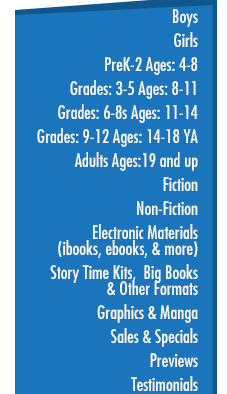 Carlos & Carmen: Get ready beginning readers, here comes Carlos and Carmen! Emergent readers will race through these easy readers alongside the twins. 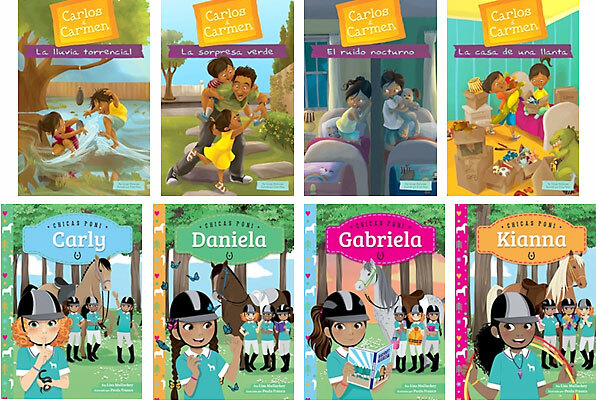 Teachers, parents, and librarians will welcome the Carlos and Carmen series to their shelves because it meets a need for children’s books that feature Latino characters living middle-class American lives. Simple Spanish terms and their definitions are introduced and reinforced in these colorful books. Translated by native Spanish speakers. Carly, Daniela, Gabriela, and Kianna – the Pony Girls are ready for their first summer at Storm Cliff Stables! In these four books, each girl has the chance to narrate her own story. Their unique personalities come through as they navigate being away from home, making friends, and caring for the horses at camp. Readers new to chapter books will love this entry into the world of Storm Cliff Stables, with larger text, fewer words, and younger girls in the same wonderful setting! Translated by native Spanish speakers.